The first benefit of the bottle of wine: the wine. But if you’re like us, you often end up saving your corks. Sometimes for the memories (Damn, that was a great Barolo), sometimes due to laziness, and sometimes because you subconsciously grasp the utility of the wine cork (beyond keeping your precious wine from getting too oxygenated). 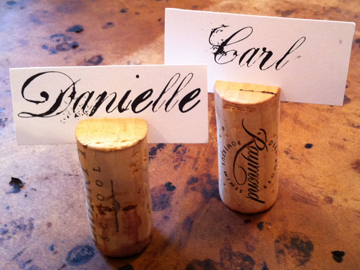 We’ve seen how corks can transform ho-hum illumination (“Yes, that lamp shade is made out of cork, why thank you!”), and we all know they make adorable place card holders. But there are plenty of other household uses, with applications ranging from the garden to the bathroom to your kitchen. Even your cat. So read on for ways to finally put that drawer full of neglected corks to good use. *Unless otherwise noted, we’re always talking about natural corks. Synthetics can have some household utility, but natural is the way to go for most of the projects below. You can use corks to beautify a candle holder, but it’s also super easy to turn the cork into a candle. Just soak it in acetone for a week. When you’re ready to burn, well for starts, do it outside, then light it and watch it go. And definitely place it in a nice steady candle holder. Safety first, y’all. The author wisely points out you’ll want to avoid synthetic corks for this super simple gardening hack. If you’ve got a high speed, sturdy blender, you can actually grind the corks straight up. But chopping by hand is just as effective, if yeah, a bunch more labor intensive. But then so is weeding. The wine part of the equation is usually what’s considered “art,” but you can turn a bunch of retired corks into some nice looking décor for your wall. Plus, everytime you walk by it, you’ll be flooded by all the wonderful, wine-soaked memories. A little more involved, but the end result is a slip-resistant, comfortable mat you can strut onto after a good shower. You’ll need an anti-slip rug pad, and you actually have to cut all the corks in half (carefully). But then it’s just some hot glue-gunning and you’ve got a creative bathmat on the cheap. These end up looking ridiculously cute, so the fact that you’re sewing cork pieces together—no doubt a bit tedious—should be worth it. And you can make any patterns you like, so long as they’re sturdy enough to support that tea kettle and dainty china glasses. Or, in our case, a massive coffee pot and some Garfiled mugs. If you’ve got any use for a straight razor—they’re good for chipping away at stubborn patches of paint and sticky labels—chances are you’ve gotten an accidental cut or two. But you can use two corks to keep things safer: one as a handle, and the other to basically “cap” off the razor when you’re done being awesome at home improvement stuff. You can actually use these super simple garden markers for any plants (especially useful if you’re the type of person who’ll plant some seeds and then totally forget what the hell you put in the soil). Forks or even a sharp stick will do. And for this one, synthetic corks work just as well.